Gold Coast Organic Lawn and Garden Fertiliser. TO PURCHASE: Call Greg on 0413 807176. Wormtec liquid organic lawn and garden fertiliser is applied very cost efficiently for you, normal house yard price is around $80.00 each job is individually quoted, we also add Kelp and Fish as a free bonus, this is cheaper than buying our product and doing it yourself. This is a totally new product and service only available on the Queensland Gold Coast and surrounding areas. I have spent quite a few years developing this Lawn and Garden fertiliser from the original Wormtec Worm Extract that we have been producing over the last 12 years and shipping Australia wide. As this is a microbial active product we are unable to ship it around Australia, so our worm extract is still the choice for shipping. This is not a compost tea type product; it’s still a microbial worm extract but it utilises totally new technology in its brewing and extraction process. Our new Liquid Organic Lawn and Garden Fertiliser contains all the Nutrients and Minerals plus all the benefits of high grade worm castings into a liquid organic microbial bio-fertiliser that not only fertilisers your lawns and gardens but assists in reducing pests and diseases. The microbes contained in our liquid organic lawn and garden fertiliser helps to eliminate both thatch build up under your turf grass and soil compaction allowing both air and water to penetrate further into your soil profile helping to reduce water requirements. Due to the microbial nature of our product the nutrients and minerals in our liquid organic lawn and garden fertiliser are retained in the soil and don’t leach out of the soil with irrigation or overwatering like conventional fertilisers. The microbes will then release the available nutrients and minerals that are in your garden soils into a soluble form for the plants to utilize. This is a totally sustainable system with no negative impact on people, pets or the environment. Wormtec Worm Farming and Vermiculture is setting the standard for quality natural organic soil improving products and our onsite organic fertiliser applications to lawn, turf, garden and agricultural crops in the Gold Coast Region. 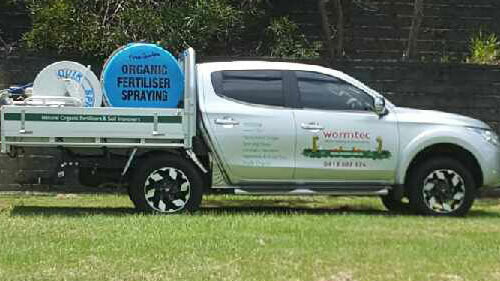 Wormtec worm farming and vermiculture have an onsite customer base from Brisbane to Kingscliff in Nsw that we service with our Liquid Organic Lawn and Garden fertiliser. We also do commercial agricultural crops with our worm extract fertiliser. Worm extract is also shipped all over the country direct to farmers and fertiliser companies that are now incorporating our extract into their own fertiliser blends. As Wormtec Worm Farming and Vermiculture are the only producers of Wormtec Liquid Organic Lawn and Garden Fertiliser and Wormtec worm extract we are the only company you can purchase this biology based fertiliser from. Here at Wormtec we have total control from the manufacture to the application on your lawns and gardens, so we are the one stop organic microbial fertiliser shop. As we are the producer buy direct and save, with no middle men price mark ups, you can also speak to us directly for all help and assistance. Wormtec Worm Farming and Vermiculture is committed to sustainable agriculture and the use of environmentally friendly natural organic soil improving products and foliage sprays. We’re prepared to work very closely with anyone to implement a more natural healthier system while reducing the use of chemical fertilisers, pesticides and herbicides. We can assist you in the transition from traditional synthetic chemical methods to the more social accepted chemical free all natural system while promoting a healthier safer environment and at the same time reducing your fertiliser costs. Wormtec Worm Farming and Vermiculture would like to show you the advantages and benefits of using our worm derived liquid organic lawn and garden fertiliser and why we should be trying to reduce synthetic chemical fertilisers, herbicides and pesticide in our gardens, lawns and agricultural applications. Wormtec Worm Farming and Vermiculture has been actively treating lawns, gardens, turf, sporting fields and acreage in the Gold Coast, Queensland region using our own produced and extracted worm derived natural organic lawn and garden fertiliser. We have had great success and results with our range of natural organic products. We pride ourselves on our natural products, customer service, our attention to detail and our reputation. We produce, manufacture and brew our natural organic product range and then apply it to your lawns, gardens and crops so we have complete control over the whole treatment process and everything is handled by us. If there is ever a problem you only have to speak to us and we will rectify the problem because there are no middle men or other companies marking up our product, service or prices. We can keep our prices ultra-competitive. Wormtec Worm Farming and Vermiculture fertilises a huge variety of commercial properties around the Gold Coast Region from the Australian War Grave areas to large housing estates, and even home owners just like you trying to grow a nice healthy lawn, garden or even vegetables and fruit trees without the problems chemical fertilisers bring along with their use. Wormtec Liquid Organic Lawn and Garden Fertiliser are totally organic so can be utilised on all your property from your lawns and gardens to your vegetables and fruit trees. As we are not spraying chemicals you won’t have any burns on your plants and there won’t be any chemical uptake in your vegetable so they are safe to eat straight from the garden. Being totally organic you eliminate the problems of chemical fertiliser and their impact on your grounds the environment and the people that work in or the residence that use the grounds. Soil compaction is one of the main problems I come across with sporting fields, lawns and turf. If you look at the number of people utilising a sporting field, and all the foot traffic compacting the soil pushing all the air out of the soil and making the soil rock hard, so both water and air have trouble entering the soil. But soil compaction is so easy to fix as long as you move away from chemical fertilisers as they are part of the problem. Soil Ph levels are one of the other problem that I see over and over again, your soil should be around Ph neutral ( Ph 7 ) I like to see a Ph around the 6.4 but we often find Ph levels around the Ph 3 on sporting fields and lawns this is normally for a chemical fertilised sporting field or lawn. I always test the soil for soil compaction and soil Ph levels before we do any fertilising at all, both soil compaction and Ph will have a large influence on your fertilising results, so they both need to be taken into account from the start. So we need to bring the Ph back to around 6.4. We then check the soil compaction so we have a reference point. Grass and turf is unable to put its roots down into the soil profile if the compaction pressure is over 300 psi of compaction pressure. The roots will just grow sideways in the top centimeter of soil. Synthetic fertilisers cause soil compaction, they also have a detrimental effect on soil microbe populations so each time you apply chemical fertilisers you will be killing more and more beneficial soil microbes each and every time you apply them. One of the jobs soil microbes do for us is to live in the soil and to open up the soil by living in the pore spaces and collinating each and every soil particle this allows both air and water easy entry into the soil profile. So if you kill off the soil microbes the soil will become compacted from foot traffic and vehicle traffic. Soil Biology is the number one key to de-compacting and aerating sporting ovals, lawn and turf, eliminating thatch layers for good, by inoculating your soil with beneficial soil microbes that have been extracted from worm castings into our Wormtec Liquid Organic Lawn and Garden Fertiliser you can eliminate both compaction and thatch problems in the one go without having to use aerators or detaching machinery. Soil Microbes coat each soil particle with a mucus layer that absorbs water this mucus layer retains more moisture in the soil profile, also because the soil microbes open up the soil profile eliminating compaction layers this then allow more moisture to enter deeper into the soil profile more water is stored for your lawn or garden use, with far less evaporation and as the microbes take organic matter deeper into the soil profile the soil retains more moisture.This also allows your grass and plants to put there roots down deeper allowing them moisture at a far deeper zone in the soil profile. Chemical fertilisers kill off soil microbes and increase soil compaction and swing your Ph from where it should be, so soils with low microbe numbers, will be unable to defend or out compete these diseased organisms both bacterial and fungal, when they arrive in your lawn and garden soils, you are then forced into treating your lawn and gardens with more chemicals that also have a detrimental effect on your soil health and microbe numbers. We utilise biology contained in our Wormtec liquid organic lawn and garden fertiliser as a bio-control helping to protect the soil, grass and plants from both pest and disease attacks, by helping to increase plant brix levels and supplying the nutrients and minerals in a soluble plant available form, the microbes will also consume disease spores from the soil and crop when the microbes are in good numbers. Building the microbial life in your soil and the microbial population will help to rebuild the soil health and vitality. Rebuilding soil microbe numbers is the key to soil fertility, if you are seeing mineral deficiency or pest, and disease attacks on your lawns, plants and vegetables it can always be traced back to mineral deficiency in the soil, don’t treat the problem you see on a plant, fix the problem once and for all, by repairing the soil. How do I break down the organic matter in my soil? One of the jobs of soil microbes in the soil is to break down organic matter in to humus and soluble forms for the grass and plants to utilise as plant food , the soil microbes and earthworms will also consume and eliminate any disease organisms contained in this organic matter or manures that you have put on your garden, the soil microbes and earth worms will also mix this organic matter into the soil profile improving the soil texture and air and water holding capacity. Organic matter cannot break down without decomposing microbes, so this organic matter will just lay on the surface of the soil, unavailable as food for your lawn and gardens, but could contain disease spores and pests, just waiting for the right conditions to attack. Wormtec Liquid Organic Lawn and Garden Fertiliser will help you. Its Microbial based. By using Wormtec Liquid Organic Lawn and Garden Fertiliser on your lawns, gardens and plants you are replacing the missing species of microbe that have been killed off with the extra benefit of soluble nutrients and minerals in an easy to apply liquid. We are the only producer of worm extract fertiliser in Australia; most other worm based products you will find in Australia are worm leachate type products. What could be easier? Spray your lawn, turf, garden or sporting field with our biology based fertiliser and let Mother Nature repair the damage. Wormtec Worm Farming and Vermiculture is here to help you make an informed decision on chemical free gardening and to assist you in any way that we can on implementing chemical free organic fertilisers on your gardens, lawns and vegetables gardens.